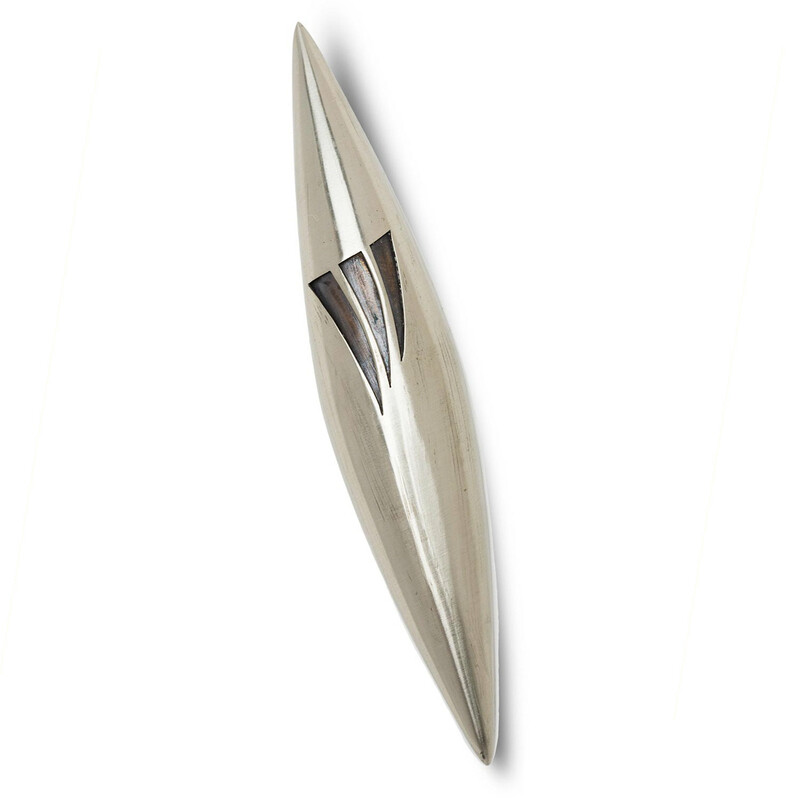 The design of this mezuzah was inspired by the Apollo Space Shuttle. An identical copy was taken into space by astronaut Gregory Chamitoff. This Mezuzah case was handcrafted in Israel by silversmith Laura Cowan (born Manchester, 1971). Influenced by a film she’d seen about space exploration, Cowan began designing mezuzot (plural of mezuzah) shaped like the moon and space shuttle. The Apollo spacecraft inspired this particular model, which came to the attention of Phil Hattis, a professor of aeronautics and astronautics at the Massachusetts Institute of Technology. Hattis purchased the Apollo Mezuzah for his former student, Jewish-American astronaut Gregory Chamitoff, prior to Chamitoff’s departure to the International Space Station aboard Space Shuttle Discovery in 2008. Chamitoff received another model of Cowan’s space-age Mezuzahs from a friend and brought both with him, even though astronauts are only allowed a limited number of personal items. To him, they represented two important elements in his life: space expoloration and the Jewish faith. Contemporary Judaica designer and Jewish artist Laura Cowan began her career in London after graduating in Silversmithing and Jewellery at London Guildhall University. She made aliyah in 1996 and started working for a Yemenite jeweler in Yaffa before starting her own business in 1999. She continues to bring her unique ideas to the field of Judaica, working from her design studio and workshop in Tel Aviv, Israel.